The majestic Fiddlers Pilgrim, aka Bruno. It has been almost two years since trainer Dev called me to ask if I would take a horse he had that had some hoof problems. At the time, I told my vet, Lynn Criner, that I would give him two years. I had forgotten that conversation until she reminded me yesterday. It has been a long two years. 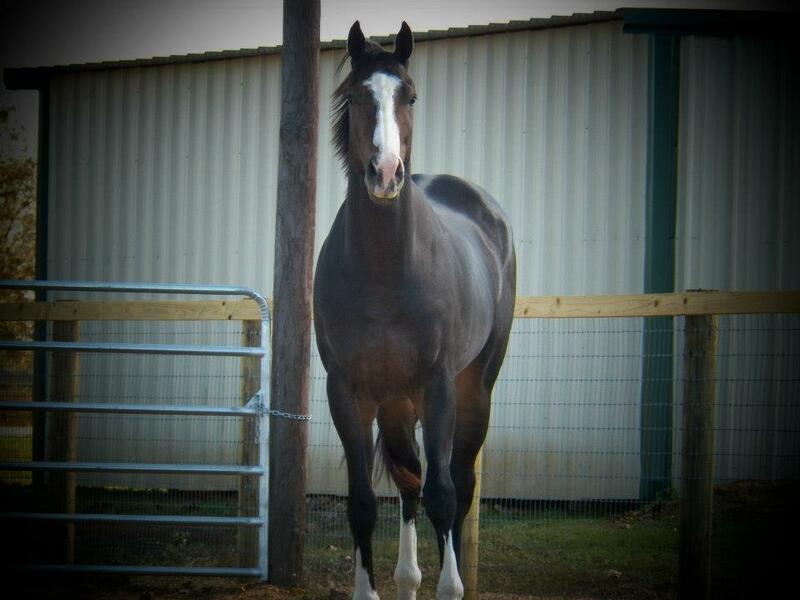 Bruno was an off the track thoroughbred bred from racing royalty A.P. Indy and Hansel. He was a staggering 17.2 hands high and weighed over 1650 pounds in the best days. He was brave, stoic and strong. Bruno has been treated for hoof infections for at least four years. I suspect maybe longer. He had surgery to treat a massive infection to his coffin bone in December 2012. 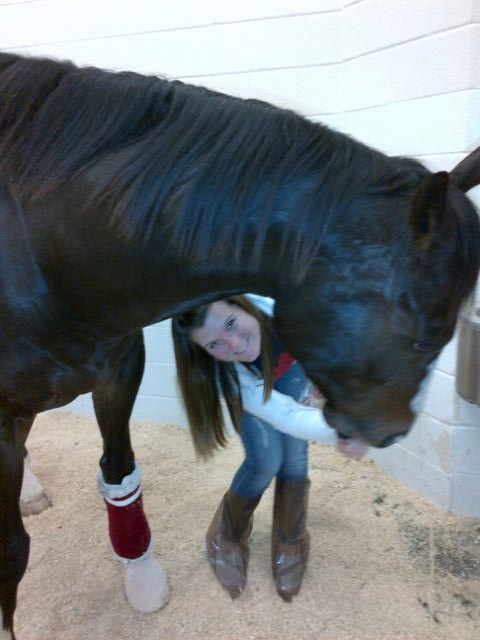 Lauren loving on Bruno after surgery at Texas A&M. He came back from the surgery alternately sound and lame for the last 18 months. 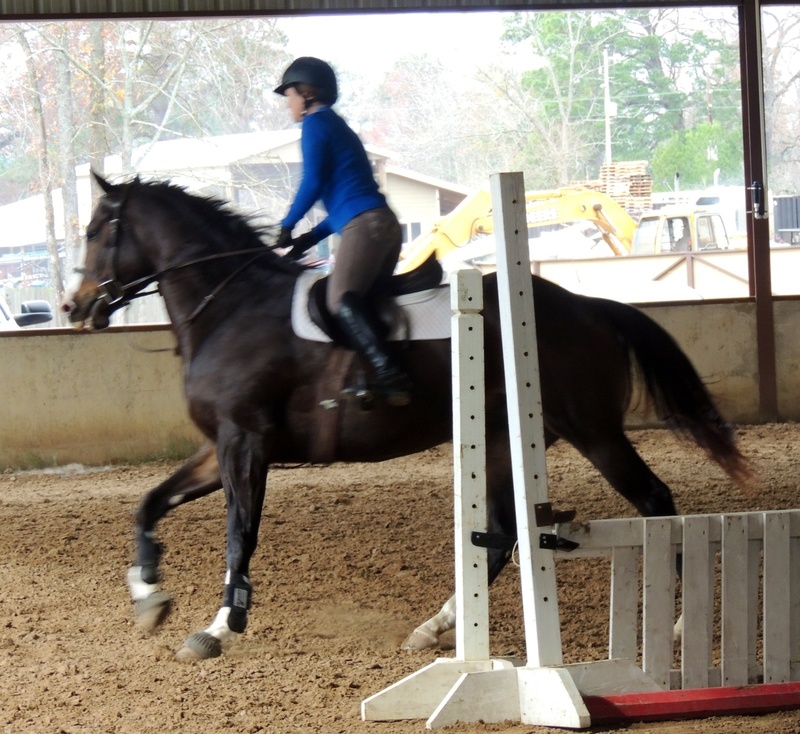 During that time Lauren got to spend two weeks with him in a focused jumping program-it was wonderful for both of them. Bruno at the trainer’s in December. 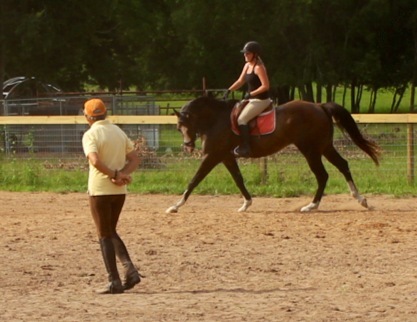 Amelia turned him into a dressage horse and we watched him stretch and reach new limits under her tutelage. 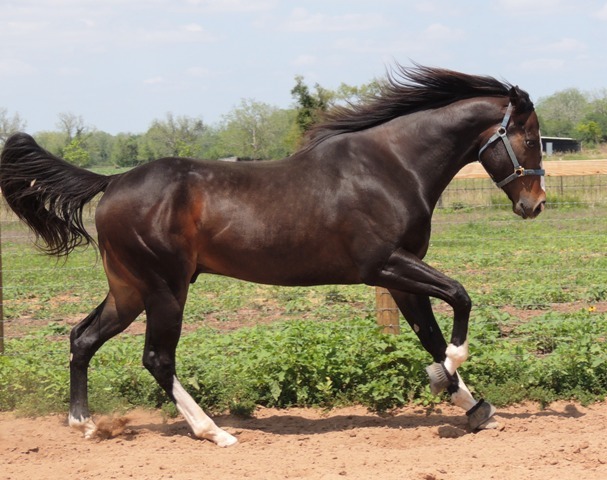 Look at the stretch in this canter! 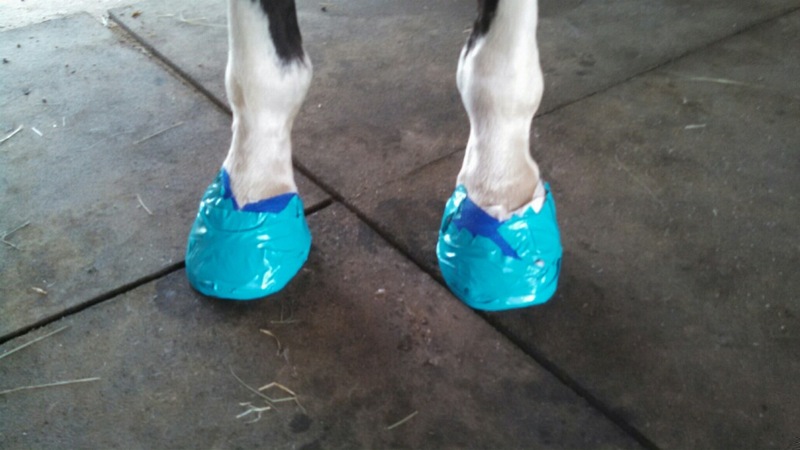 Hoof problems plagued him regularly. When Amelia left on vacation in July, the hoof infection was back with a vengeance. We would clear the infection in one hoof (or so we thought) only to have it re-surface in another. There was not a moment except last Tuesday where he was without severe pain. I enlisted the help of my vet and farrier and we tried multiple types of antibiotics, pain killers, shoeing adjustments (really pads on his now bare feet). I even ordered over $200 of corrective padded, glue on shoes for him just this last Friday. Bru’s feet wrapped up once again. But no matter what we did, this beautiful horse was not pain-free. If I could have asked him, as the orthopedic surgeon asks Lauren each time we visit what her pain level was I know it would have been over a 5, even on the best of days. Last Tuesday, which was to be Bruno’s last good day, he went with me to have pictures taken in the bottom pasture. He was not pain-free but he could get around. 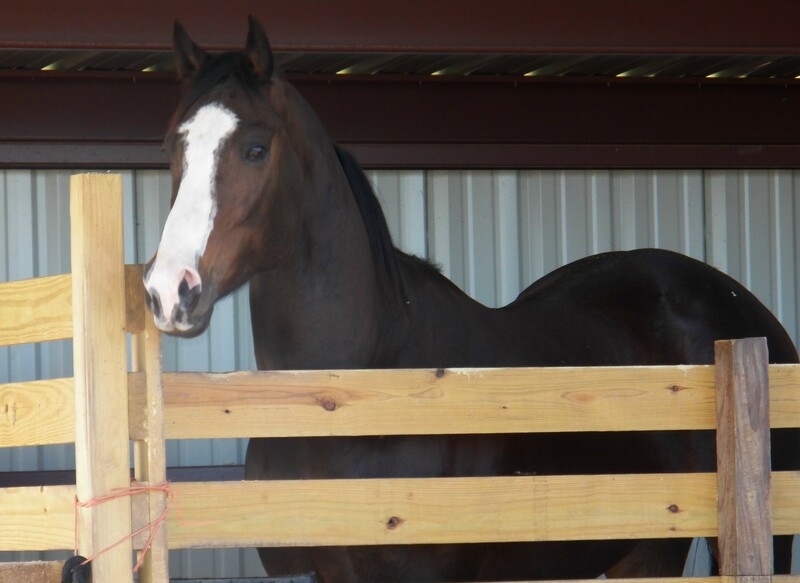 By Wednesday morning, he was racked in pain again, lying in the far corner of his stall not able or willing to get up. He would eat and drink if he had heavy doses of IV drugs on board, otherwise he just laid silently in the shavings. We had been treating his good foot but now the infection was running hot in his bad foot-the one he had surgery on. Dr. Criner has been out for hours each day. Taking x-rays, administering IVs with pain killers and antibiotics. There is no solid, one, overwhelming reason why this young, gallant horse is so sick but we cannot get him better. By Friday, Lauren and I both discussed it and knew we could not let this go on much longer. His pain levels were tremendous. We had identified at least eight separate sites of abscesses in his left hoof. His right hoof was infected as well. You could smell the thick stench of infection as you entered the barn hallway. We told Dr. Criner, and she agreed, that we would not let this continue past Monday if we could not get a major turn-around or resolution. Meantime, it was a lot like watching my mother slip away to death in hospice care. We were losing Bruno day by day, hour by hour. Together, Lauren, her friend Libby, my friend Gaylyn, Dr. Criner and myself stood by Bruno and held him as he was humanely euthanized today. It was time to release him from pain. I don’t know why Bruno came into my life. Maybe because I could do so little to help my mother and felt so helpless watching her slowly drift towards death over the years she was here, that Bruno came so I could prove to myself that I tried everything in my power (and my pocketbook) to make him whole again. Sadly, that failed as well. Grief enfolds me tonight. Maybe I just needed to meet this proud, handsome, puppy-dog of giant and have a gauge by which to measure every future horse I meet. I do not know. 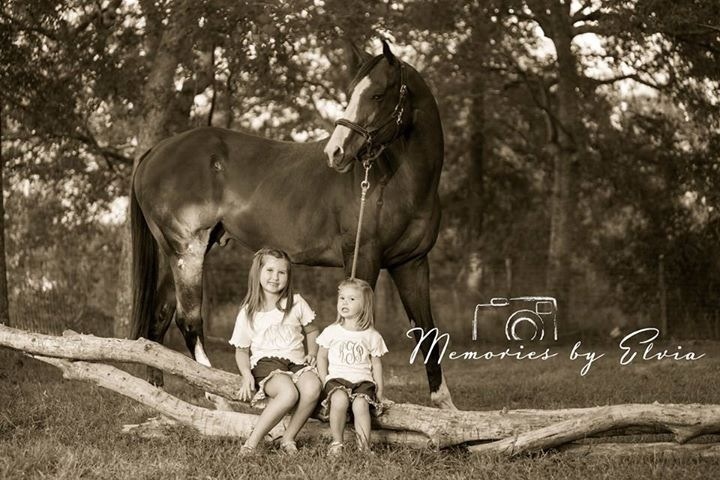 The horror of Lauren’s recent injury, mother’s death and now laying this huge horse down to die make my heart brittle. To love deeply is to hurt deeply. It will be awhile before I stand straight and tall overcoming the weight of my injured heart. Bruno, I loved you so…I am so sorry you are gone. Bruno looking me in the eye. This entry was posted in A Bruno Story and tagged greeting death, Horse euthanasia, losing what you love, love by Exechorseluver. Bookmark the permalink. Hugs. I am so sorry. You tried everything! I am so sorry. I was just positive Bruno was going to make it, but I guess Someone Else had bigger plans. You did the right thing, as difficult as the decision was to make. You are a good steward. Many hugs. 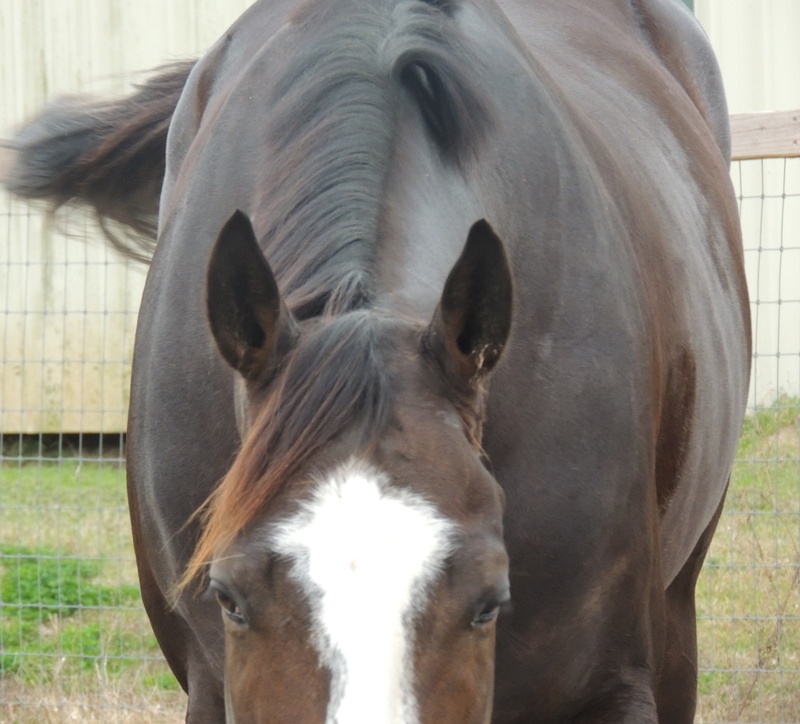 I owned a horse I loved whom I put down due to severe pain from lymphangitis in her leg. She was in such intense pain it was the only human thing to do. Even the last day she gave to me her unselfish love. She was a part of my soul and takes care of me now in my dreams. I know I will see her again one day, my Black Beauty! We are so very sorry for your loss. Bruno was a beautiful horse. We always enjoyed seeing pictures of him. I am so sad to hear that Bruno list his battle. I know how hard that loss must be for all of you. I’m sending love and prayers your way. So sorry for your loss. You gave him the best life possible. He loved you dearly for that! I think you have had enough pain and loss. I hope that the hole in your heart heals and this year brings you great ( or at least meaningful!) gifts of joy. You have earned them. Sending the warmest of virtual hugs and oddly, thanks to you for sharing your pain. It makes us all less complacent. You and Lauren gave a valiant effort over a long period of time. Truly, you did your best to heal him and you did your best for him by putting him down. My condolences. Cindy and Lauren, you tried, oh you tried. You gave him two years of love that he wouldn’t have gotten anywhere else. I am so sorry. So, so sorry for your loss. He was truly a beautiful animal. Prayer for you, that your heart heals soon!